The American Express Leadership Academy Emerging Innovators Bootcamps gather 100 changemakers around the globe who are positively transforming communities and revolutionizing healthcare, education, food security and more. 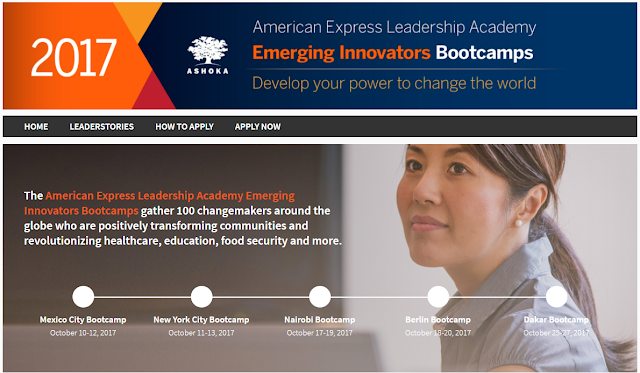 Apply for one of 100 spots at our leadership Bootcamps, which will be held in five locations around the world this fall. As an Emerging Innovator, you’ll receive industry insights, personalized feedback, direct connections to sector leaders and ongoing support from a network of peers who are rising stars in the social enterprise world. Tell us why you deserve a spot. We find incredible leaders and then we train and support them powerfully through the 3,000+ member strong American Express Leadership Academy. As a result, our graduates go on to win some of the most prestigious awards around, including our Ashoka Fellowship, and honors from organizations like Echoing Green, Skoll, StartingBloc and Unreasonable Institute. Our grads even make the Forbes “30 Under 30” list.